Thanks to Dale, Harold, Nick and Elena, the Agua Viva system is installed and operational. The well water at Fundación Salvación is now being filtered and disinfected with ozone. The kids at the orphanage now drink water that is clean, safe and healthy. As soon as we arrived we learned that no water lines were connected from the well to the water room. Harold, Nick and Elena started on the real work of constructing the water system, while Dale consulted with staff at Fundacion Salvacion. Nick and Elena worked to lay (actually hang from the roof) pipe from the only water source on property to the water room, as Dale and Harold consulted with Rodrigo, one of the men on staff at the orphanage assigned to become one of the system operators to learn how the water is sourced. The first thing Rodrigo explained that they have a dual system, and they also soon learned that it is under capacity, in disrepair, leaking and often overwhelmed. It is also contributing to the underground water table that the orphanage’s well draws from. So while learning where our drain water was going we also learned where their well water was coming from. For several years, Fundacion Salvacion has been operating with the same well and pump, and water had been flowing poorly as of late. The leaders thought that the drought was the source of the lack of water. And there is a drought when it should be rainy season, but that was only part of the issue. It turns out that the well pump was so clogged with mud and sediment that it only operated intermittently. They thought it was on a timer. But in reality, they just needed a new pump and a deeper well! They would not have known the source of the problem had we not been there. And they could not have gotten it fixed as quickly and affordably if we weren’t there with extra hands and equipment. 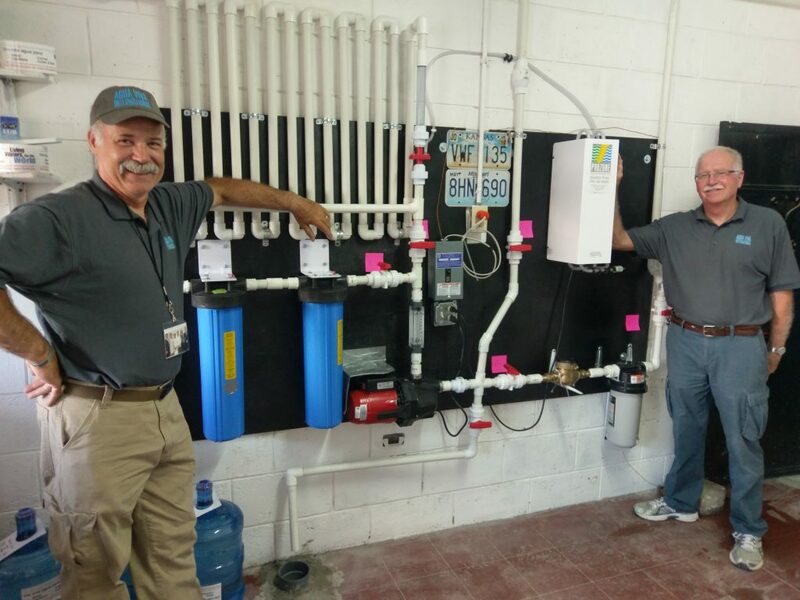 Our mission was initially to install a water purification system…but we ended up doing that as well as building connecting pipe from the well, helping with the well repair, securing the water tanks to avoid theft, and more. It’s amazing how the timing lined up perfectly, and our team did such a good job working late hours to make a lasting impact on this site. Now they not only have clean water for their kids, but they can use the water system as a form of income for the foundation. How awesome is that! ?